Precisely 20 years after the first film’s debut, the Starship Troopers franchise continues with 2017’s animated Traitor of Mars. Just a raw recruit in the original flick, Federation Trooper Johnny Rico (voiced by Casper Van Dien) eventually achieved the rank of general. However, prior events knocked down his rank, and now Colonel Rico finds himself assigned to train new cadets near Mars. They go through a trial by fire when enemy bugs launch a violent campaign aimed at the red planet and Johnny needs to lead the defense. Because the original Troopers didn’t live up to commercial expectations, I never thought it’d inspire one sequel, much less four. However, the world of direct-to-video programming made these practical, as does the increasingly cheap price required for computer generated imagery. 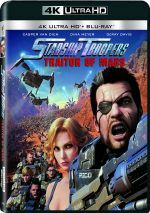 While the first two Troopers sequels offered live-action affairs, Traitor and 2012’s Invasion opted for CG animation – and bargain basement animation at that. Actually, that may be a little unfair, as the material never looks as bad as some of the ultra-cheap crap you’ll see in childrens’ TV programming. Nonetheless, for a feature film – even one meant direct-to-video – the quality of the animation seems poor. While various ships and other mechanical elements seem fine, organic components look awful – especially humans. Character movements seem robotic, and faces lack any form of natural expressiveness. This means the characters always suffer from an awfully unnatural impression, and even lip movements falter, as the mouths don’t match dialogue in a satisfying manner. Honestly, the movie often resembled nothing more than a long videogame cut scene – this animation would’ve been acceptable 20 years ago but it’s far subpar by 2017 standards. Not that the material demands Pixar-level quality, as Traitor becomes a stale battle film. It opens with a “fake out” stolen straight from 1982’s Star Trek II - that scene delighted 35 years ago, but it seems trite and predictable now. Everything else about Traitor comes across as similarly tired, and it lacks the sense of irony and satire that enlivened the original film. Even though original writer Ed Neumeier returns, the script offers no sense of life – it just provides a one-dimensional “rookies under fire” combat flick with bland characters and no sense of creativity. This seems like a shame because Traitor offers more of the original film’s participants since 1997. In addition to Neumeier – who also penned the second and third sequels – we get Van Dien’s first reprisal of Rico since Troopers 3 and also find Dina Meyer as Dizzy Flores for the first time since 1997. Too bad they waste their time with such a weak film. Traitor of Mars offers a bland, by-the-numbers action flick with none of the insight or wit that made the original Troopers memorable. It’s mediocre at best. 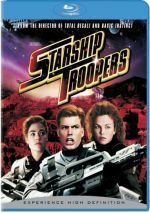 Starship Troopers: Traitor of Mars appears in an aspect ratio of approximately 1.78:1 on this 4K UHD Disc. This was a decent but erratic presentation. Overall sharpness seemed good. A little softness crept into some interiors, but the majority of the film offered concise visuals. I saw no moiré effects, but jaggies could interfere at times. Neither edge haloes nor source flaws marred the proceedings. Colors tended toward a grungy green feel as well as the expected red/orange of Mars. This meant the hues didn’t exactly leap off the screen, but the disc reproduced them in an accurate manner. Blacks were dark and dense, while low-light shots boasted solid clarity. Overall, this was an image that often worked fine but the occasional softness and jagged edges made it a “B-“. Downconverted to Dolby TrueHD 7.1, the film’s Dolby Atmos soundtrack offered a good kick in the pants. The movie offered a lot of battle sequences, and those used the speakers to create a vivid, impactful sense of the material. Bugs, ships and various military weapons broadened around the room to create a vivid setting for the material. Audio quality worked well, as speech remained natural and concise. Music was bold and bright, while effects appeared accurate and robust, with nice low-end response. The soundtrack added life to the tale. How did the 4K UHD release compare to the Blu-ray version? The Atmos audio was more involving and engaging, while visuals seemed tighter and more dynamic, though it suffered from the same issues as the Blu-ray. Still, the 4K offered the superior version of the film. The package also provides a Blu-ray copy of Traitor, and that’s where almost all the extras reside. The two-part A Look Inside fills a total of 16 minutes, three seconds with info from directors Masaru Matsumoto and Shinji Aramaki, effects supervisor Takuya Kiyozuka, animation supervisor Hiroshi Takeuchi, background and props supervisor Masamitsu Tasaki, rigging supervisor/crowds supervisor Toshihiko Masaki, character and props supervisor Seiji Tayama, concept designer Shinji Usui, and producers Max Nishi and Joseph Chou. “Look” examines design, effects and animation, story/characters, and cast. The technical side works better, as those notes offer depth. The parts about story and characters tend to be bland. Under Expanding the Universe, we get three clips: “20 Years and Counting” (6:27), “Continuing the Universe” (3:35) and “Traitor of Mars” (6:45). Across these, we hear from writer Ed Neumeier and actor Casper Van Dien. “Universe” covers aspects of the first film and the sequels as well as elements of Traitor. Neumeier and Van Dien throw out a handful of interesting observations but the featurettes lack a lot of real impact. One Deleted Scene lasts 44 seconds. It shows a flirty sequence between Johnny and Carmen. It adds nothing. A Gallery presents 34 screens of concept art. It delivers a pretty good collection. Two minor 4K UHD exclusives appear. Moments provides a sampling of movie scenes that cover “Johnny Rico”, “Dizzy Flores”, “Sky Marshall Amy Snapp” and “Action Sequences”. This seems like a pointless compilation, though not quite as useless as Cast & Crew. It simply shows pictures of Van Dien, Matsumoto, Aramaki and actor Dina Meyer. What’s the purpose? The Blu-ray opens with ads for Resident Evil: Vendetta, SWAT: Under Siege, Sniper: Ultimate Kill, Kill ‘Em All, Life and Starship Troopers: Invasion. No trailer for Traitor appears here. For the series’ fifth film, we get the wholly forgettable Starship Troopers: Traitor of Mars. A mix of dull characters, mediocre action and poor animation, the movie lacks much appeal. The 4K UHD brings us very good audio along with generally positive picture and a smattering of supplements. Even diehard Troopers fans should skip this dud.